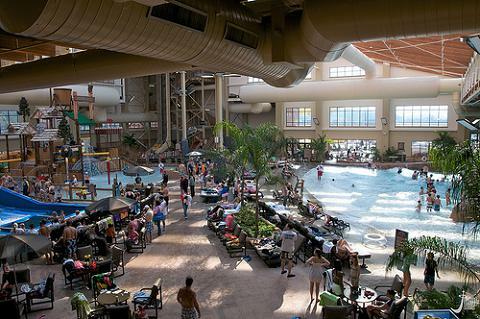 The Wilderness Resort Gatlinburg has one of the largest indoor water parks for you and your family to enjoy! The best news is the use of water park is included with your stay. 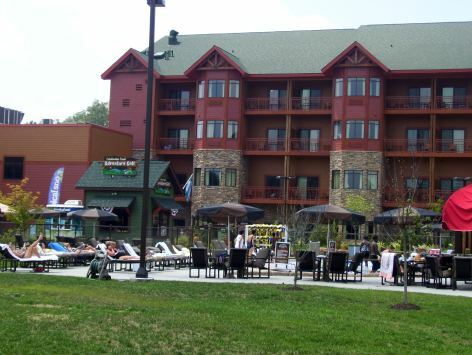 The original Wilderness Resort located in the Wisconsin Dells WI profess to be “America’s Largest Water Park Resort.” With a natural setting like the Smoky Mountains, Wilderness Resort will likely build on that claim. Wilderness Resort Gatlinburg combines the rustic charm of the Smoky Mountains with world class resort amenities. They are currently planning one of the largest indoor - outdoor water parks in the nation that will provide year round entertainment and fun for kids of all ages. This resort area is preparing to be the all in one vacation destination family resort in the Pigeon Forge - Gatlinburg area. With nearly one thousand acres to develop, they have plans of becoming a one of a kind, full service destination resort area. Wilderness Resort Gatlinburg is located in the new Bridgemont development project in Sevierville, TN. This major development is a large enough project that it will likely become a destination itself. The development area will consist of just about everything to include shopping, restaurants, theaters and of course the Wilderness Resort Gatlinburg destination with luxury and affordable condos, cabin accommodations and indoor-outdoor water parks. Should you need information to plan your trip, or to find the best deals on area entertainment or lodging we have often found Reserve Pigeon Forge to be an excellent resource. 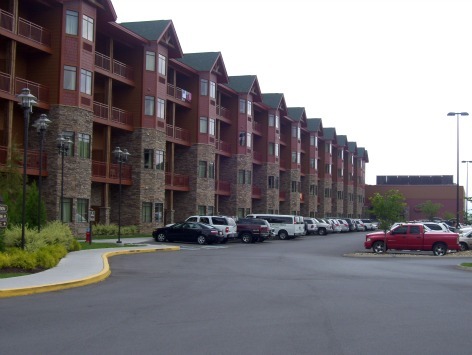 The Wilderness Resort Gatlinburg offers more than 400 hundred guest rooms. You can choose from several rustic room options, plus 1, 2, or 3 bedroom cabins or condos. There are two similar lodging choices on the same property. Stone Hill Lodge was the original property at the Wilderness Event Center, now across the street from the main resort area name the River Lodge. The Salamander Springs water park at is very nice. It is smaller with a large play area, two water slides and a nice big pool. The larger outdoor water park and the only indoor water park is just beyond the street at the River Lodge. But they make it easier than walking by offering a shuttle bus. Depending on the ages of your children or if during the winter months you may find advantages for your family either way. Now having stayed at both our children preferred staying in the River Lodge to be closer to all the main activities. We stayed in the Stone Hill area the first summer Wilderness Resort Gatlinburg opened. The guest room we stayed in was equipped with 2 queen beds and a sleeper sofa, and we used all since we brought the kids and a few of their friends. Also, the room had a microwave, mini refrigerator, flat screen television, coffee maker and a safe for valuables while at the pool. You can always upgrade to a room with a balcony or whirlpool. Our room had a very nice view of the golf course and the Smoky Mountains. The “River Lodge” consists of multi-room suites, many of which will overlook an amazing indoor and outdoor water park. The suites within the lodge will accommodate families up to 15 people. This resort area of the Wilderness Resort Gatlinburg blends mountain rustic with luxury accommodations nestled in the foothills of the Great Smoky Mountains. This years trip we stayed in a one bedroom deluxe room in the River Lodge. This accommodations has two separate room areas with sleeping arrangements for up to 10 persons. The sleeping arrangements included 1 queen, 1 queen/twin bunk, 1 queen murphy, 1 queen sofa sleeper, 1 twin sofa sleeper. We had 2 full bathrooms, a nice L shaped kitchen with a dining table area that opened up to a large open living room area. This area had a couch, chairs and a nice flat screen TV and a fireplace. The main sleeping quarters has a door between the main rooms that can be locked for privacy, The first bedroom space has a balcony area, and the second bedroom area has a large mini-fridge, microwave, coffee maker, small table for 2, plus another TV. Having a full kitchen on vacation is really convenient and a real money saver. We tried to eat every breakfast and lunch in the room. We also had a couple of dinners in, but chose to go out to a restaurant a couple of nights. We brought food from home in plastic tubs and coolers, then purchased what we needed from the grocery store just down the road. The room was great for this vacation and worked well for everyone in the entire family. "Photo by Jason Bayer ©2008 J Man Studios"
The Wilderness Resort Gatlinburg has one of the largest indoor water parks for you and your family to enjoy! The best news is the use of water park is included with your stay. For starters, the Wilderness has a one of a kind 60,000 square feet indoor water park area appropriately named the Wild Water Dome. The area is quite expansive and for indoors it is really amazing. We really like the feeling of the wide open space and see-through roof. It has more of an outdoors beach feel with the lounge chairs and the sound of the waves. Just so you can plan ahead, they provide life jackets and towels at each park, which is very nice. Speaking of making waves, the Dome will include an awesome Great Wave Pool. It is 10,000 square feet of rolling waves that are a lot of fun to ride in an inner tube, or you can just sit and listen to the relaxing sounds of the shore. It really feels like you are outside but it’s always has ideal weather inside all year round. The Dome also has a one of a kind hi-tech glass roof that somehow allows you to suntan all year round. Be sure to bring your sunglasses and suntan oil along. The Wilderness Resort Gatlinburg is also has some amazing water slides featuring the Storm Chaser where four persons on the same tube plummet through a dark tunnel before dropping into a funnel where you splash strait down into a pool below. We definitely had fun on this ride and must have gone down it four or five times. We also made good use of the other water slides in the dome area. The Wild Water Dome has two water slides with the second being namedTrail Twisters. It’s an enclosed tube slide where you ride a circular float tube. More of a nice tube ride at a slower pace that the entire family can ride and enjoy. The Runaway Canyon is the newest addition tube ride to the Wild Water Dome. it’s a family raft ride starting about 60 feet above the floor of the dome. The ride will take you through 450 feet of water curtains, tunnels, turns, loops, and a the drop of course. Looks like another winner! Wilderness Resort Gatlinburg also has a very unique attraction named the Smokies Surf Rider which simulates surfing/bodysurfing. Try to imagine 20,000 gallons of water flowing under your surf board to create an ocean-like wave. This is a very challenging ride, and combines the skills of surfing, skateboarding and snowboarding. This ride is for the daring to say the least. The boys both gave it a try, but it will a few more runs tomorrow to find their balance. Just watching was enough fun for me. 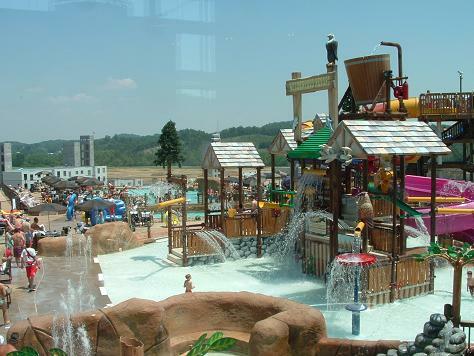 The indoor water park also includes extensive kiddie play areas including Washout Mountain . It’s a multi-tier area with slides and tons of spraying water features to blast each other using water cannons. The kids really have fun here with a lot of cool areas to climb and hide and then rush to find the best splash-down area when the warning bell rings under the enormous water Tipping Bucket. More play areas for the younger ages in mind include the Flying Squirrel and the Snapping Turtle Activity Pool. One of my favorite areas is the Magnolia Grove Hot Spa. It’s a huge hot tub that was built partially inside and partially outside of the Dome. Our most recent visit was over the winter holidays. It was very relaxing to sit in the hot tub watching and feeling a few snowflakes fall around you. Wilderness Resort Gatlinburg has two fantastic outdoor water parks with the initial park named Salamandor Springs. It’s right outside the Stone Hill hotel area and yes your admission is included in your stay at the Wilderness. It has two water slides, a large play area and a good size pool. The larger outdoor water park and the only indoor water park is across the street at the River Lodge for which they offer a shuttle bus. Lunkers Landing offers a four story interactive play and spray structure with some fun features. It features several slides and over 50 interactive play and spray areas for endless ways to get wet. Speaking of ways to get wet, watch out for the Tipping Bait Bucket that douses all the little minnows (children) around it with over 500 gallons of water every five minutes! The Timber Rattler is just one of many waterslides they have on the grounds. It also happens to be the longest tube slide in TN, with twists and turns that are fun for the whole family! It was definitely one of our favorites as we all rode it several times. The River Otter is one of the areas longest body slides. This one is really fast as this slide is more then 180 feet long but it only takes a few seconds to splash down. Wilderness Resort Gatlinburg also offers the Catfish Corral activity pool. The kids will have a great time with the water basketball and hidden play areas while parents can unwind in the outdoor hot spa. Or for the ultimate in relaxation, head to the enormous lounging pool with beach area. Minnow Marsh is the perfect pool area for the minnows in your family with its zero depth pool. Parents can relax nearby at the Wildflower Lagoon hot tub and unwind after a hectic day at the water park. The great lazy river was a good way to wrap up the day and just float away. When you get hungry while in Salamandor Springs, no need to worry. They have a café and watering hole that offer a wide variety of food and drinks and are right there for your convenience. Wilderness Resort Gatlinburg offers a second larger outdoor water park named Lake Wilderness. It offers several acres of multi-level water fun with many slides, an interactive area, pools and of course a lazy river tube ride in an expansive outdoor setting. On this trip we visited in early August of this past summer. It was warm…very warm, humid…very humid, and sunny…yes, very sunny. So we decided to splurge some and reserved a poolside cabana on the second day of our trip. It was worth every dollar. You have your own private sitting area, a personal attendant, more of a deluxe type seating arrangement, the overhead water spray misters where fantastic in the heat and a TV if you so choose to watch. Wilderness Resort Gatlinburg has to be one of the best resort water parks in the country. There are so many activity options, and for all age groups of your family. If you want to take it easy then Adventure River is just fine. We took several relaxing trips floating down and around the lazy river. Definitely one of the better lazy rivers we have been to. Again for families with small children they have 2-person tubes with a seat in front for the young kids. For a little more excitement they have a very nice Lake Wilderness Wave Pool. You can go for a swim or grab your tube and ride the ocean like waves. When you need a break from all that beach fun, take the kids over to the Cataloochee Creek Adventure Golf for 18 holes of mini-golf. Need a break, getting water logged? 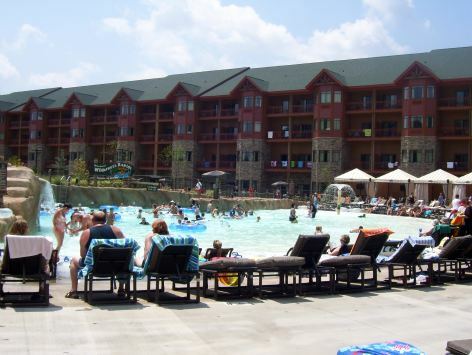 Wilderness Resort Gatlinburg offers activities and events for the entire family. When you need a break from the water, visit the Back Country Video Arcade. Check out the huge arcade and redemption center which feature loads of games and contests, including dozens of the latest video games! And refresh yourself and the family with refreshments at the Wild Canyon Café located near the arcade. Also check out the new arcade in the River Lodge called the Bobcats Den for bigger and better fun. If you are hungry, no need to worry, Wilderness Resort Gatlinburg has five dining areas. When have time for a sit down meal check out either the Hidden Trail Bar or the Thirsty Miner. They offer simple meals to buffets in a family friendly atmosphere decorated with all natural materials giving it an outdoorsy appeal. Both restaurants feature a bar area serving gourmet coffee, soft drinks, beer and cocktails. For a quick hitter or easy meal check over the Coyote Cove, Grizzly Grill or Marketplace Deli! They offer hot dogs, burgers, sandwiches, pizza and cool drinks conveniently located near the arcades and water parks. If you need more exercise than found through swimming and water fun, visit the resorts fitness area. We took advantage of the treadmills, weight machines and other fitness equipment when we stayed at Wilderness Resort Gatlinburg to do our best to stay in tip-top shape. With everything to do at the resort and in the area it was a challenge making the time, but we managed to get in a couple of good workouts. Bring the Golf Clubs to Wilderness Resort Gatlinburg! We were able to enjoy a round of golf at Eagle’s Landing this summer. It was a very nice 18 hole links style golf course with beautiful views of the Smoky Mountains. Soon into the round we understood why the course was rated so highly by Golf Magazine. The Championship Course was recognized as one of the top courses in the state being the “Best Public Course” in 1995. They offer an 18-hole, par 72 championship layout, with five sets of tees for golfers of all skill levels. When you are first approaching the course it appears to be wide open with no trees. It also seemed to be a longer and more challenging golf course than we expected at first glance. It looks flat with wide open fairways but it has some tricky holes and the rough is quite thick. But when you get into the round there are lots of hills and you cross over several creeks and water hazards. It was definitely well maintained with some challenging narrow fairways and greens. We had a great time, but we always do when golf is involved. The Club is equipped with a driving range, pitching area, two practice bunkers and a putting green. Eagle’s Landing has challenged some of the best golfers in the state by hosting such events as the Tennessee PGA Championship, Tennessee State Open Qualifying and Tennessee Intercollegiate Championship. Wilderness Resort Gatlinburg has recently added another 18 hole golf course adjacent to and in conjunction with Eagle’s Landing. They offer 36 holes of golf that will challenge players at all skill levels. One course will have a designation as resort course, while the other will be the Championship Course. It also appears they may be in the process of opening a brand new state of the art clubhouse just adjacent to the River Lodge resort area. With nearly one thousand acres to work with, they have plans of becoming a one of a kind destination. Wilderness Resort Gatlinburg is located in the new Bridgemont development project in Sevierville, TN. Bridgemont Events and entertainment will become a city within a city! It will have over 500,000 square feet to include many of the major brand name players in retail shopping, restaurants, entertainment and much more. The Wilderness Resort Gatlinburg is of course directly adjacent to Sevierville’s new Event Center. It will surely be a hot spot for business meetings, family reunions and weddings…so book early! The banquet room can seat up to 500 guests with a variety of room sizes and choice of meals as well. 1) When we made our phone reservations for Wilderness Resort Gatlinburg we were advised that we could actually check-in anytime after 12 pm to pre-register and use the water park even though the normal check-in is 4:00 pm. The kids can come dressed in swim attire or you can simply change in the locker. The front desk called us on our cell phone when our room was ready. 2) Also good to know is the normal check-out is 11am, and still you are free to enjoy the water park for the remainder of the day. 3) We may have mentioned earlier there are two similar lodging choices on the same but somewhat separated property. Stone Hill Lodge was the original property now across the street from the main River Lodge. The outdoor water park at Stone Hill is very nice. It is smaller with two water slides and a large play area and a good size pool. The larger outdoor water park and the only indoor water park is across the street at the River Lodge for which they offer a shuttle bus. Depending on the ages of your children or if during the winter months you may find advantages for your family either way. Our children are older so we preferred staying in the River Lodge to be closer to all the main activities. 4) Once you check-in at the main desk, you are told to go to the "concierge" desk to get your parking pass. Depending on how busy they are, or your luck of the draw, they may attempt to offer time share and property ownership meetings. You have the option of just saying NO, and ask for the parking passes. 5) If you stay in a room with a kitchen we suggest you bring: a sponge and dishwashing machine soap for dishes, clothes washing machine soap, extra drinking cups. 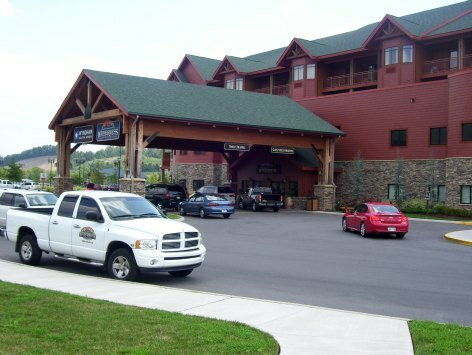 6) Wilderness Resort Gatlinburg does offer 10% Military discounts. 7) Pets are not invited. 8) Use of the water park only allowed for paying overnight guests. 9) No walk in food or drinks in the water parks. 10) The resort provides towels for guest use in the water park. 11) They have several laundry areas in the resorts. 12) In rooms with kitchens they provide kitchens utensils, pots, pans, toaster, coffeemaker, full size refrigerator, microwave, stove and dishwasher.